A choice of three temperature controllers with either analog or digital temperature selectors offers temperature management over the range of -40 to 250°C with stability as good as ±0.005°C. Each model has a rugged, splashproof case with all submerged parts being made of either stainless steel or high temperature self-extinguishing plastic. Powerful pressure circulating pumps with external circulation connections are fitted as standard on all models. 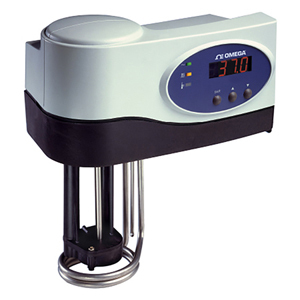 With a choice of three different temperature controllers and five stainless steel baths having a capacity from 8 to 48 liters, a range of 15 different systems is available to suit most laboratory and industrial applications. Inlet and outlet pipes at the rear of the controller can be used for external circulation to another piece of apparatus or sealed for circulation within the bath itself. The baths are also suitable for below ambient applications, and can be used at sub-ambient temperatures with a cooling coil or with RCTB-3000 Series Dip and Flow Coolers. Designed to be used with a HCTB-3000 Series thermo-regulator, these new baths incorporate attractive carrying handles for added safety. The four smaller models have seam-free stainless steel interiors for easy cleaning. The largest bath, Bath-48, is of welded construction. All baths have stoved enamel steel outer cases. The RCTB-3000 Series Dip and Flow coolers are designed for use at below ambient temperatures down to -35°C. The Flow Coolers works in conjunction with a thermo-regulator. Continually extracts heat from the bath fluid by means of the heat exchanger which is built into the unit. The cooling head of the Dip Cooler fits neatly and unobtrusively into the corner of the bath and can be secured with a specially designed mounting bracket. Even if cooling can be achieved by cold tap water, a dip cooler is recommended, as it conserves water and is easier and more convenient to use.